South Africa President Thabo Mbeki A bizarre dispute around "AIDS dissidents" who argue that HIV does not cause AIDS and oppose standard treatment to prevent maternal-infant transmission threatens to damage the World AIDS Conference in Durban (July 9-14, 2000) and divert attention from efforts to control the epidemic worldwide. Recently this unnecessary controversy has escalated, while the parties continue to overlook cultural and economic/political differences behind it. Now there is talk that the U.S. government might somehow get involved. Several partial histories of the controversy have appeared in recent news stories1-4; you can find these articles and others from www.aegis.org (click on the word "search" near the upper left of the home page). A search for 'Rasnick' will find many of the articles published around March or April, 2000, and a search for 'Mbeki' will find many more. The AEGIS database is updated daily. For at least several years the South African government has been unpopular with the pharmaceutical industry, internationally and domestically, because of government efforts to reduce the prices South Africa pays for drugs, which are often even higher that U.S. prices. While the government is now controlled by the black majority, the judiciary, press, and many other institutions are less representative and more conservative, as blacks were kept out of many professions under apartheid, and it takes years to train and develop senior professionals. 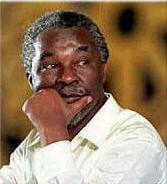 As a leading anti-apartheid activist, Mbeki received much of his education in exile. The recent AIDS dispute came to wider international attention last fall, with South African government reluctance to use AZT to prevent transmission of HIV from pregnant women to their children. The reasons are unclear, but many treatment activists in South Africa and elsewhere think the government fears that providing antiretrovirals to prevent transmission would lead to demands for antiretroviral treatment for everyone who needed it, demands which the government could not fulfill, given current prices and international trade rules. Whatever the reason, South African President Thabo Mbeki raised concerns by citing reports of AZT toxicity, which many believe came to his attention through AIDS dissident sites on the Internet--despite the worldwide consensus that the benefit of using AZT or other antiretroviral treatment to reduce mother-to-infant HIV transmission greatly outweighs the risk. The dispute boiled over in mid March, after press reports that Mbeki had spoken by phone with David Rasnick, an AIDS-dissident scientist and a colleague of Peter Duesberg, the best-known advocate of the theory that HIV is harmless and does not cause AIDS, while drug abuse or AIDS drugs do. According to Rasnick, he talked to President Mbeki "for perhaps 10 minutes" on January 21. When this call was reported about six weeks later, it touched off intense controversy1-4--not the contents of the call, but the fact that it took place at all. President Mbeki's office responded with several statements from its head of communications, Parks Mankahlana. From "Building a Monument to Intolerance," March 23: "It turns out the President's cardinal sin was making contact with someone by the name of David Rasnick who does not share the commonly held view that HIV leads to AIDS. It is said that it is wrong for him to talk to such people. They are even called dissidents. If he spoke to these people he would undermine the work done over the many years and he would cause South Africans and other people who live with HIV and AIDS to lower their guard." And from "Just Stick to What Mbeki Said," also March 23, "Why has Mbeki generated such a violent reaction from the same people who should cherish a head of government championing the cause of HIV/AIDS awareness? Why is it that the only President in the world whose every published photograph has the HIV awareness ribbon emblazoned on his breast has become the subject of scorn and ridicule? Why is it that a President that authorized an additional 73,000,000 Rand [about $12,000,000] for AIDS research is accused of embracing voodoo science?" Despite the negative press, Mbeki remains very popular in South Africa, even among some of those who strongly disagree with his handling of this issue. "Mbeki's way, says one of his close associates, 'is to absorb, take everything in, and then make a decision, as a chief does in a kgotla. Always a compromise, no winners or losers. Everybody recognizes everybody else's interests.' Mbeki's idea of a good time has always been the Glenfiddich kgotla: plonk a bottle in the middle of the table and spend hours listening to people talk, absorbing their thinking. "...When his comrades say that Thabo Mbeki does not tolerate dissent, what they often seem to mean is that they don't know what he thinks, and that they fear he will not like their ideas (he does not suffer fools), so they refrain from proffering them. The fact that he withholds opinions and emotions - and that he then dispenses them sparingly - may well be a function of his character, but it is also a powerful way of wielding control." Incidentally, this newsletter mentioned Mbeki a year ago, in the context of intellectual property and drug-pricing issues; he represented South Africa in negotiations with U.S. Vice President Gore, in November 1998. The destructive fight between South African President Mbeki and many AIDS experts in South Africa and elsewhere is in no one's interest except the AIDS dissidents--and perhaps pharmaceutical companies relieved that attention is diverted from intellectual-property rules and access to medication. So what can be done? First, we in the AIDS community can support South Africa and other governments in overcoming the real obstacles to moving toward treatment (starting with prevention of mother-to-infant HIV transmission, where one dose of nevirapine is likely to make the difference between a normal lifespan and dying of AIDS, without the difficulties of lifelong drug regimens and toxicity). But we have to recognize that the decision belongs to each government, that we cannot make it for them. And we should accept Mbeki's approach of listening to all parties in a dispute before making a decision--which contrasts with the more common style of deciding who is credible and only listening to them. There is little chance Mbeki will declare that HIV does not cause AIDS. The real issue is to maintain effective working relationships. [It is worth noting that if U.S. President Clinton, for example, had personally called Dr. Rasnick, the reaction would be harsher than it was against Mbeki; people would think Clinton had lost his mind. Not because he cannot talk with whom he wants (an issue Mbeki has raised), but because there is a scientific community to decide such issues as whether the HIV-is-harmless movement has merit. That decision has been made, and it is hardly reassuring for a head of state to simply bypass the process. A more difficult issue is the role of the pharmaceutical industry. In the U.S., we have a permanently uncomfortable relationship between public health and an industry which has powers of life and death, but little real public interest or other concern beyond near-term profits. And yet we have the enormous advantage of a context where most people do get treated, where one way or another, medical care often does get delivered. Compare the situation in most developing countries (we do not know about South Africa specifically). The international pharmaceutical industry has far more power in the medical-research community (if there is any medical research), because there is no other funding. And what usually attracts industry is the chance to use local populations, often with few ethical restrictions, to test drugs to be marketed elsewhere. The whole context is that most people will never be treated, and in the case of HIV, left to die. There is no mystery why people are attracted to HIV-is-harmless nonsense. When they have no viable alternatives, they look for other options. When none exist (often because none are allowed), they naturally gravitate to medical cults and other fanaticism. Which is why AIDS dissidents may have a big future among the 90% of the world's people with HIV who have no access to effective treatment. Statement of Purpose: AIDS Treatment News reports on experimental and standard treatments, especially those available now. We interview physicians, scientists, other health professionals, and persons with AIDS or HIV; we also collect information from meetings and conferences, medical journals, and computer databases. Long-term survivors have usually tried many different treatments, and found combinations which work for them. AIDS Treatment News does not recommend particular therapies, but seeks to increase the options available. Subscription Information: Call 800/TREAT-1-2 Businesses, Institutions, Professionals: $270/year. Includes early delivery of an extra copy by email. Nonprofit organizations: $135/year. Includes early delivery of an extra copy by email. Individuals: $120/year, or $70 for six months. Special discount for persons with financial difficulties: $54/year, or $30 for six months. If you cannot afford a subscription, please write or call. Outside North, Central, or South America, add air mail postage: $20/year, $10 for six months. Back issues available. Fax subscriptions, bulk rates, and multiple subscriptions are available; contact our office for details. Please send U.S. funds: personal check or bank draft, international postal money order, or travelers checks. Copyright 2000 by John S. James.